After 50 years with the Stony Brook Math Department Anthony V. Phillips has officially become Professor Emeritus as of May 31, 2016. 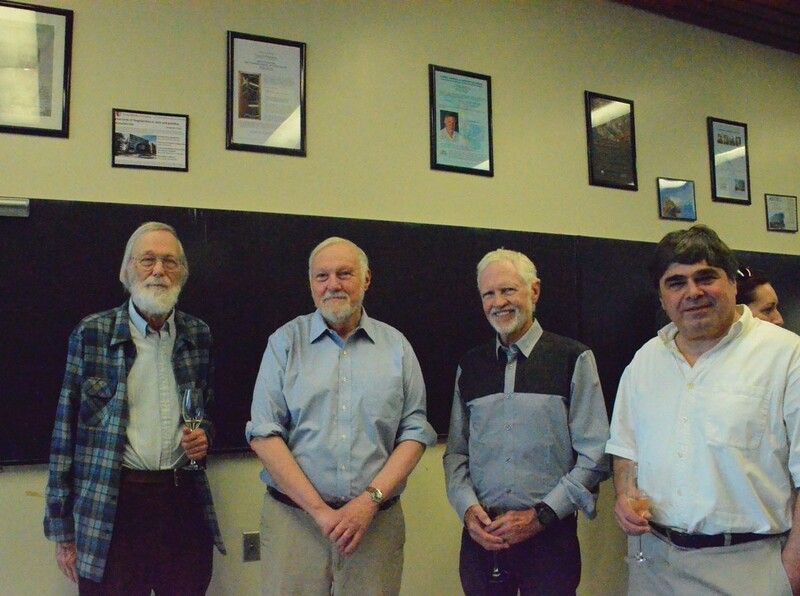 The following interview features toasts presented at the farewell tea, held in the Math Department Common Room to celebrate Tony’s life at Stony Brook University. Was the farewell tea party a true farewell? It was a mock farewell, as I am staying on for three more years as a John S. Toll Professor. This Fall I will be running the Graduate Student Practicum, which involves all graduate students who are teaching for the first time. We do classroom exercises; I visit their classes and we “debrief” afterwards; another class gets taped and we review the tape together. Tony Phillips: We have a great faculty, and that’s another plus. Dennis Sullivan told me once that one of the privileges of being a mathematician is being in contact with really extraordinary people, and if Dennis, who himself is quite extraordinary, thinks of it that way… We’ve worked with people like Thurston, Gromov, Milnor—and these luminaries,­­ ­extraordinary human beings, were our friends! Tony Phillips: We were a small department of 20–25 people, and we were young: fifteen of us were in our 20s and early 30s—you can’t recreate that! 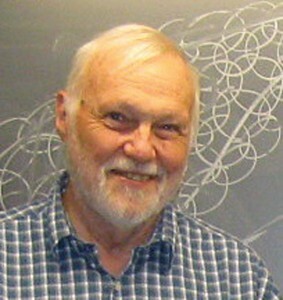 Jim Simons was the chair, tasked with building up a world-class Mathematics department. The University was expanding, and expanding into mathematics. John Toll, the Stony Brook President, trusted Jim to make high quality hires. Jim and I arrived here in 1968; until then it had been mostly a service department, but there was a graduate program in place, and Bill Barcus and his colleagues had maintained rigorous standards. So Jim had a solid foundation to build on. The transition from the old to the new was quite smooth, and Jim was very good at this. It was almost like an industry here, hiring mathematicians. We had dinners and parties here almost every week; it was a lot of fun. Many up-and-coming mathematicians came through, and some of them stayed. Jim ran up an incredible bill at the restaurant—he kept charging meals, but it turned out there was no account to charge them to; Ron Douglas, the next chair, for the first couple of years had to work through the accumulated local debt Jim had run up… It wasn’t lavish spending, just nice dinners at the “Elks” in Port Jefferson. (An old-fashioned American restaurant, good fish. Where the Starbucks is now). That was the adolescence of the ­department. Happy times, and a lot of important work got done: when Cheeger and Gromoll proved their wonderful theorem, that every positively curved complete Riemannian manifold is fibered over an embedded “soul,” we started calling them “The Soul Brothers.” It was an exciting time. The Stony Brook department has kept this quality of openness and lack of pretention since those days. Many of us have worked at maintaining that spirit, and I think-I hope-it’s now in the DNA of the department. If you ask people what it’s like at Stony Brook, they’ll probably tell you it’s a very friendly department, very open, no prima donnas. I am very grateful for that. The other thing that was very important to me was the contact between the Mathematics and the Physics departments, which goes way back. There is the ­celebrated encounter between C. N. Yang and Jim ­Simons, which led to the discovery that what physicists called “gauge field,” was in fact identical to something mathematicians had been studying for 40 years, under the name of “connection in a principal fibre bundle.” The insight led to an enormous ­development in modern physics and also, very ­significantly, in modern mathematics. In 1978 Jim commissioned me to write a propaganda piece for “Research,” a SUNY Central publication, about the differential geometry group at Stony Brook. He said: “Of course, you will have to talk about the Aharonov-Bohm effect.” I’d never heard of it, but I read up and realized it was an example of really non-trivial topology and geometry manifesting itself in a physics ­experiment. I also remembered Yang coming down to tea one afternoon, very excited, exclaiming “Fibre bundles exist!”—he was talking about a neutron-precession experiment that had just been performed. I wrote about both these experiments (with my friend Herb Bernstein) in Scientific American, and ended up working in that field for 5 or 6 years; that public-relations assignment from Jim turned out to be very valuable for me. Mikhail Lyubich: Just to elaborate on how Tony brought Gromov to Stony Brook I would like to quote some very nice ­recollections by Tony and ­Gromov. So, they met in Leningrad, Tony came back with this idea to bring Gromov and wrote him his ­famous coded letter that read: “an involutive ­gromomorphism G: SU ➞ US of admissible type T transforms MG ➞ SB” This cryptic message passed the Soviet censors, however, Misha himself didn’t understand it at first… Anyway, in the end it worked! Tony Phillips: When I was in Russia on the Inter-Academy exchange program in 1969, my advisor Sergei Novikov told me I had to go to Leningrad to meet this young mathematician Gromov. 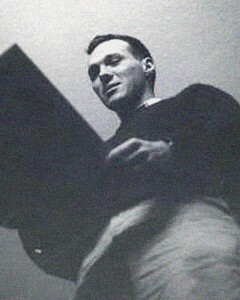 He arranged my trip; I gave a talk, and spoke with everybody: Yasha Eliashberg, who was a student then, V.A. Rokhlin, the great topologist and Misha’s ­advisor. I’d studied some Russian, but it was even feebler than it is now. I couldn’t converse, but everyone knew some other ­language: Eliashberg knew French, Rokhlin knew German, and Misha knew some kind of English. In the evening I was invited to Misha’s apartment, where of course there was vodka. At one point I didn’t know what language I was speaking, and that’s the only time this has ever happened to me! (They say that ­Russians like to get foreigners drunk just to see what they are really like). John Morgan: Upper East Side! Tell us about your role as Mathematics Executive Officer at the Simons Center. In the very beginning of the Simons Center I had that title and was on the board. I was involved in all discussions about what was the best way to have a research center, about the layout of the building, volume of public and ­private spaces, should there be a cafeteria or not (I was against the cafeteria, as a matter of fact—I thought it would be a distraction; of course I love it now). Tony Phillips: Personally, I am proud of my work with Nina Douglas and Christian White on the Iconic Wall (and the brochure for the wall, which was a big deal and a lot of work) and I’m proud of the Penrose pavement. The wall wasn’t my idea, but the pavement was. Initially I wanted it for the ground floor, but the ­architects suggested putting it in the outdoor area where it is now. It worked out extremely well. 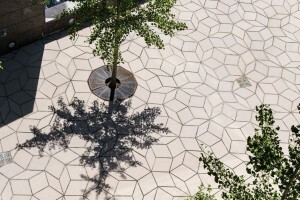 ­Carmen Menocal, one of the ­architects, really went with the idea and adapted it brilliantly, getting the pattern to match the shape of the courtyard and even finding a way to put the trees in conforming to the pattern—it’s perfect, I’m very, very happy with it! I’ve also been very pleased to watch the development of the Simons Center Arts Program. Recently, for example, there was a great show of work by Manfred Mohr, Pioneer of Algorithmic Art. Some of his creations were done on analog printers at Brookhaven, before there was such a thing as computer graphics. I was very grateful to get acquainted with this guy. 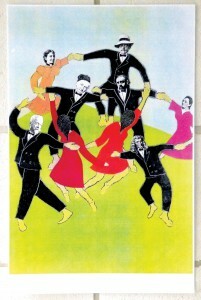 Mikhail Lyubich: We are standing in Tony’s Gallery, as half of these posters in Math Common Room were produced by Tony! Tony Phillips: I made some of them, I made the Milnor poster. Here is a sketch for it, made with a primitive color copier in 1991. In the cultural mathematics section of the list of your works the words “labyrinths and mazes” are mentioned at least 6 times. 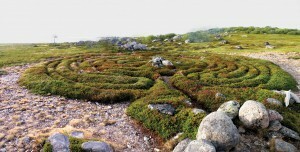 My interest in labyrinths came about through serendipity. I had a friend Jean-Louis Bourgeois, Louise Bourgeois’s son. Jean-Louis styled himself a labyrinthologist. He taught me about a traditional labyrinth kids draw as a game in India, which we know as the Cretan maze. Later, visiting friends in Tucson, I noticed that a basket they had on the wall, woven by the local­ ­Indians, had the same maze pattern that Jean-Pierre had told me about. How did this thing get from Crete to Arizona? The next year at my parents’, I was going through a Sotheby’s catalog (my father was working for them then). It was a sale of Judaica. 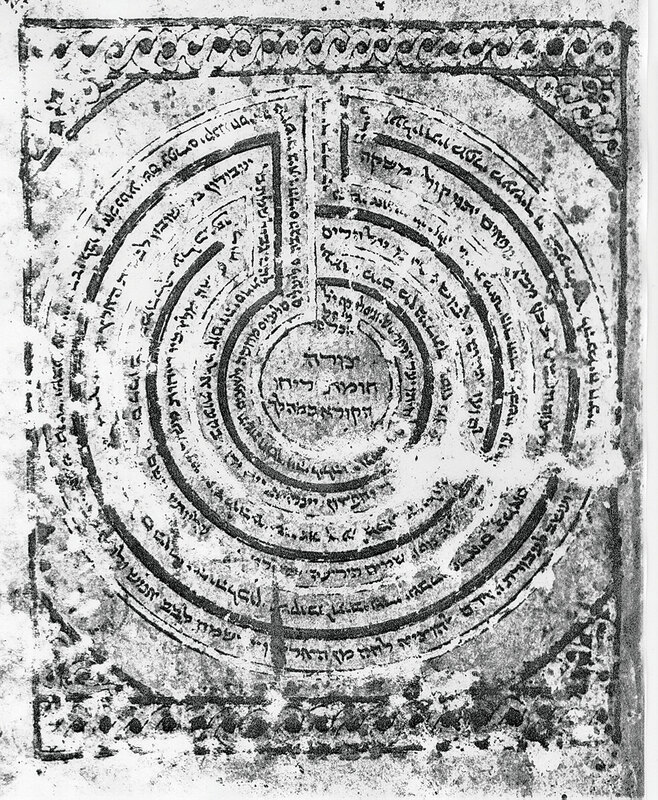 There was a picture from a medieval manuscript, a Sefer Haftorot, representing the 7 walls of Jericho as labyrinth. It was very much like the Cretan, but different! Being a mathematician, I said to myself: one can be one, but if there are two, there’s got to be a lot! I started looking at their mathematical properties and figured out how you could generate hundreds of them. Each of these labyrinths has a depth, say N, and the question naturally arises, how many different labyrinths are there of depth N? Let’s call it that number M(N). There is no way to compute this number from N: you have to construct them all and count how many you have. But M(N) increases exponentially with N. I programmed a computer to calculate it up to M(22) = 73 424 650. The next even number would have taken me 16 times longer, etc. But it turned out that the same function had just come up in theoretical physics, counting something called rainbow diagrams; physicists used better methods to push the calculation up to M(48) = 794 337 831 754 564 188 184. This was a nice example of mathematics in the air, how it crystallizes and these amazing coincidences happen (there was a third simultaneous calculation of M(N) in a still different context, in Warren Smith’s Princeton thesis). It’s like a Möbius strip – if you see a picture of one you know it has to be late 19th century, or more recent. Nobody thought of a Möbius strip before, in some sense it didn’t exist; the idea sort of blossomed. 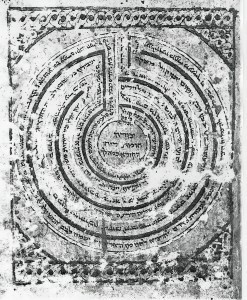 The main reference on labyrinths is the 1988 book by Hermann Kern. It’s encyclopedic, except that he didn’t know about the stone labyrinths on islands of the Solovki Archipelago in the White Sea. 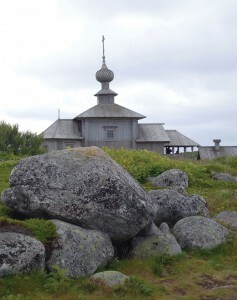 There is an obvious continuity between that ancient ­tradition and similar constructions in Finland and Sweden (on the other side of the peninsula), with some unexplained differences. Now that I am retired maybe I can get out there to check. Your co-authorship with Moira Chas resulted in 3 papers, one, bearing an intriguing title Counting almost simple curves on the “pair of pants”, in preparation. It’s been something new for me, and hard, but a lot of fun. Moira has been studying curves on surfaces (the “pair of pants” is a nickname for the thrice-punctured sphere) and has used the computer to discover very interesting patterns in the relation between length and self-intersection number; we have been trying to figure out Why? In a way it’s easier than some kind of mathematics, where the level of abstraction can be very high. Here everything is totally concrete, but the patterns are mysterious. For example, we can prove that a certain phenomenon cuts in for sufficiently long curves, but the computer data give an exact starting point. Trying to improve our result leads to more and more complications. It’s amazingly intricate, but we’re getting there. Jack Milnor: I’ve probably known Tony longer than anyone, and it’s been a great pleasure all these years. Congratulations to endurance – lasting 50 years at Stony Brook! In a recent interview Martin Hairer spoke about his interest in sound, and his love for Pink Floyd. In your case it is Bach and bird songs. Martin wrote an excellent sound-processing software package called Amadeus, which I’ve been using for the last 15 years; when I read that Martin Hairer had won the Fields Medal I thought this must be the son of the person who wrote the software, as it was so long ago—but it was the same guy; he did it when he was in high school! I use his software to edit bird song recordings. It makes beautiful sonograms and is all-around perfect for the job. It was a great pleasure to meet him at his Simons Center workshop. I believe that the connection between math and sound hasn’t been as well explored as the visual connections. Take M.C.Escher, and all the energy that has gone into making intricate mathematical graphic designs, especially with fractals. It’s like candy – you can’t stop eating it, and yet… I recently came across a website with a “Mandelbrot zoom”—you start looking, and you watch it unfold further and further; it keeps going, and going, and going… This incredible structure is there, but what does it mean? One place where I found “sonification” to be useful is in thinking about tides. Before I moved out here I hadn’t thought about them all. But living on Strong’s Neck I would drive past Little Bay every morning around the same time; some days it was full, and some days it was empty. I discovered tide tables, and started wondering how they were ­generated. They turn out to be the product of wonderful 19th century physics and mathematics, much of it due to Kelvin. The tides are driven by gravity, and depend on the relative position of the Sun, the Moon and the Earth, and on the rotation of the Earth, so all the forces are completely understood. But at any given port, the exact pattern depends on the local undersea topography, and the way the water there is connected to other bodies of water, in a totally mathematically un-analyzable way. Also, because the various astronomical periods involved (year, month, day, etc.) are not rationally related, the pattern never repeats exactly. But Kelvin and company figured out how to take a month’s worth of tide readings at a port, and use Fourier analysis with small integer combinations of the astronomical frequencies to predict the height of that tide at that port at any time in the future. They even built amazing machines to sum up the Fourier series and produce the data for the tide ­tables. (Part of the joy of being a mathematician is in coming across these amazing mathematical ­patterns). So, sonification: the sequence of high and low tide points can be interpreted as a 4-part musical score; each port has its own distinctive tune. For a conference in Venice I recently commissioned Levi Lorenzo, one of our Music graduate students, to score a couple of ports: Venice (marimba) and ­Ancona (wind quartet). He did a beautiful job. Dennis Sullivan: Quality, culture, and taste! A true gentleman. Now, what’s a true gentleman? There is an essay by Cardinal Newman by which a gentleman is someone “who reduces conflict without reducing content.” True gentleman, Tony Phillips! Tony Phillips: A toast to Stony Brook! Party on! Derived categories and Chow groups of hyperkaehler and Calabi-Yau varieties: September 19-23, 2016.